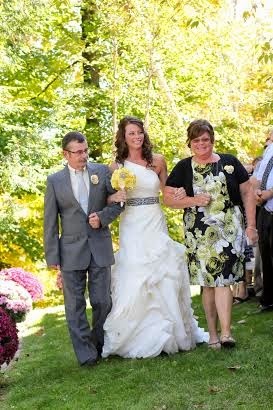 Meet Jordan, a lovely bride we created a custom package for in September of last year. 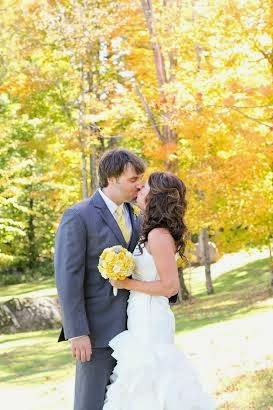 Jordan's colors, flowers, and overall wedding choices were perfect for the natural setting of her big day! We were so honored to be trusted with creating one of the most important aspects of a wedding for Jordan! Her journey from meeting her groom to making the greatest of commitments on her wedding day was truly the classic American love story. We know it will melt your heart, just as it did ours. Though Jordan and Clark had met prior to their fateful encounter in 2009, the sparks that flew were newfound. They ran into each other again in their hometown of Gouverner, New York on the basketball court of a local pickup league. Jordan fondly remembers Clark's basketball skills as not being NBA worthy, but when he stepped off the court, his manners and chivalrous nature got her attention in a big way. She describes him as being the ultimate gentlemen, just as sweet in nature today as he was back then. For their first date they went to the movies, and although she describes the film as having been horrible and completely off par for what their own relationship would become, she remembers Clark's kind personality shining through. Clark proposed to Jordan one week after she returned from a family trip to the Bahamas! The time without Jordan around was proof to Clark of just how much he enjoyed spending his life with her. It was time to cement their love into the span of forever! Though neither of the sweet couple are great at keeping secrets or presents a surprise, Jordan was just that when she came home to find Clark standing at the top of the stairs, on one knee. Clark had turned on their song, Unthought Known by Pearl Jam, to set the mood to pop that all important question. On September 28th of 2013, Jordan and Clark were wed at their lakeside home on Sylvia Lake in New York. Jordan and her bridesmaids were thrilled and relaxed, beginning the day with a little jump for joy! 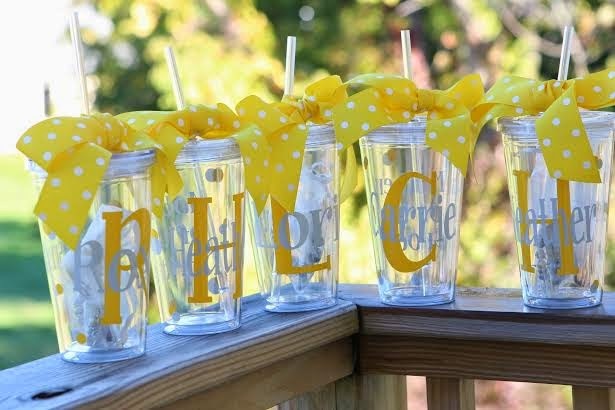 Jordan had gifts waiting for her bridesmaids when the festivities began! 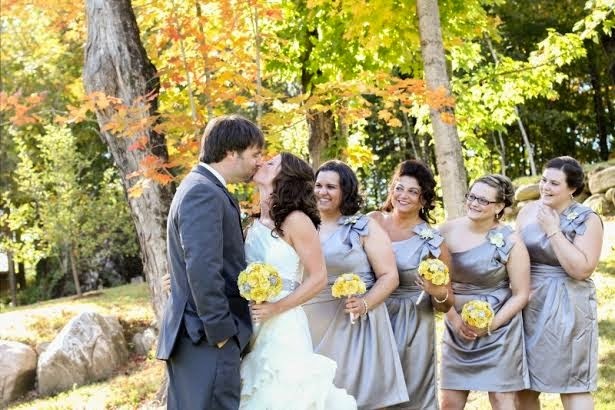 The ceremony was small with friends and family, intimate and sweet in nature. 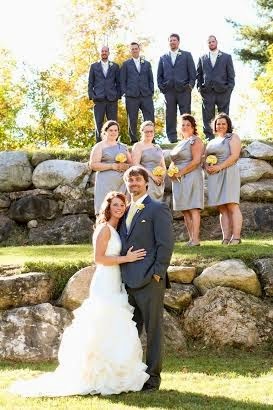 Pictured below is the bridal party at the beautiful lakeside setting. 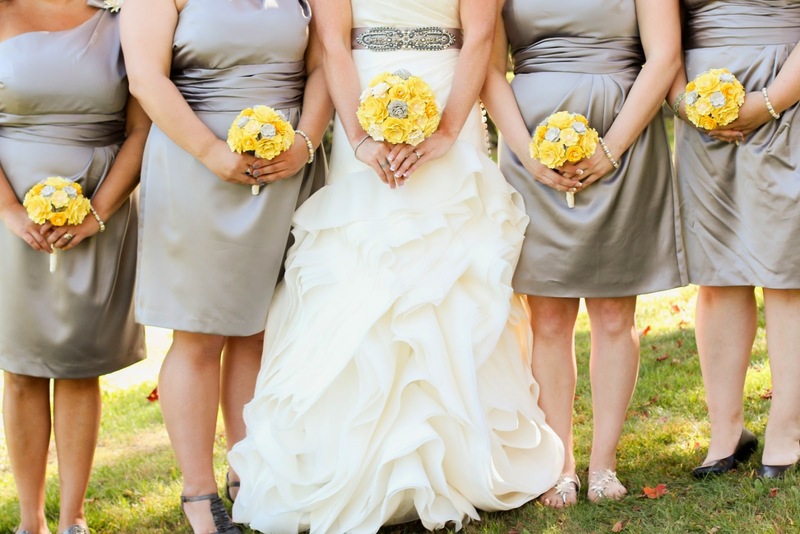 Jordan's flowers were done in shades of yellow and grey. 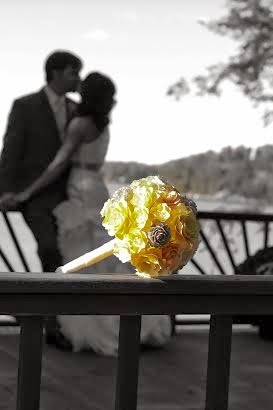 The bouquets themselves were bright and sunny with a hint of grey that cooled the intensity of the yellows to give a mellow, fall sunlight feel. Her gown was a soft white with a touch of silver around her waist, complimenting her delicate shape! With the glorious shades of nature's own yellows on display all around them, the setting was truly perfect, and on accident matched exactly. It was one of those days that you couldn't have planned more perfectly, everything just fell exactly into place, just like Jordan and Clark's own Americana romance. With a kiss, the two were transformed into one, forever and always. No two sweeter people had ever been brought together before! Our flowers stood witness to the joining of two lives, decorated the melting of two hearts together as one, and symbolized the soft warmth of the love felt between Jordan and Clark. Following the ceremony, the celebration moved to another location at Fort Drum Commons, in Fort Drum, New York. 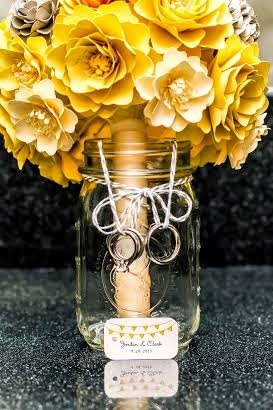 Mason jars and flip-flops were placed around the outside of the reception area for guests to take with them as tokens of thanks for participating in the couple's big day. 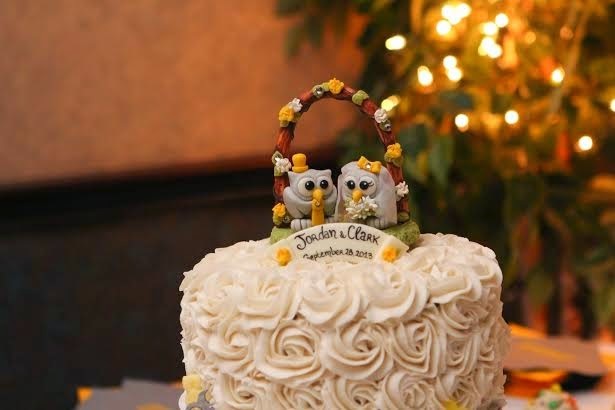 With Jordan and Clark being fans of all things owl, the birds were found in little touches all over the room, in the confetti on the tables, the cake and other charming ways. The tables were done up in soft dove gray table cloths, with yellow cloth napkins accenting the gray. 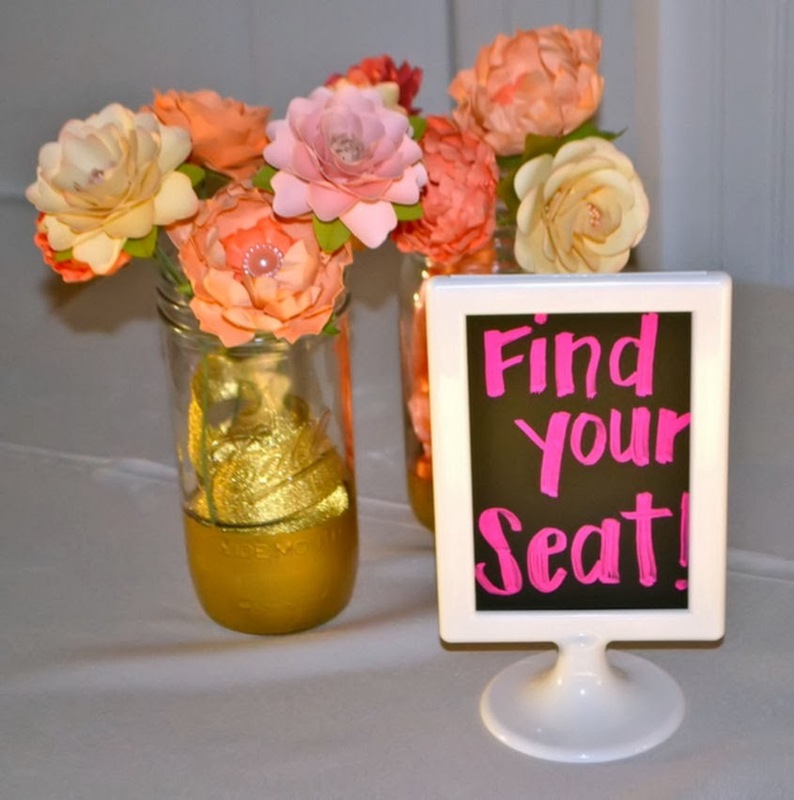 Rustic mason jars were on the tables, and chair covers gave a perfect final touch to the decor. 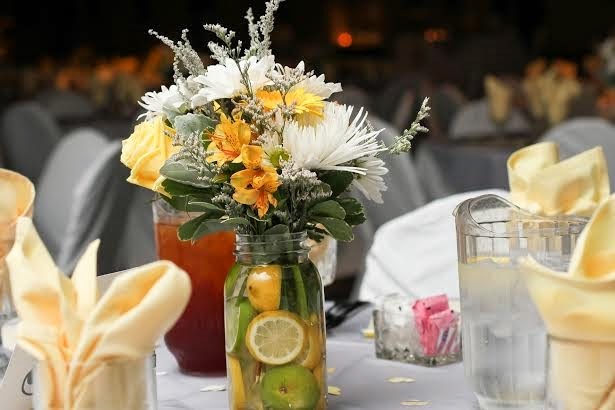 Jordan's mother in law had the flowers for the tables made at a local florist, and with the lemons and limes they were the perfect addition to the reception's decor. 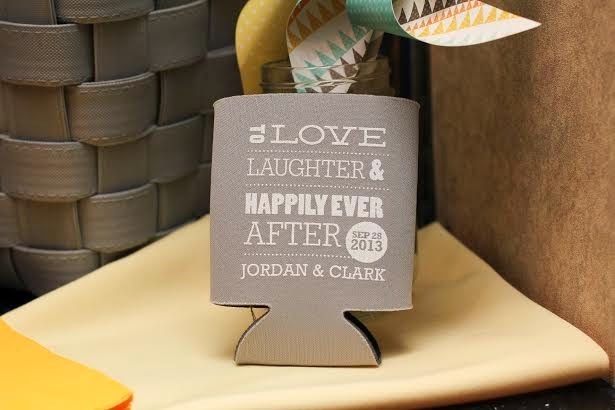 Jordan fully utilized the vendors on Etsy, getting many small detail items like the personalized koozies, sugar cubes shaped like owls, the cake topper and many, many other items from the online handmade catalogue. In the end, Jordan and Clark look back on their day with fond memories, warmed hearts, and the knowledge that every detail helped tell the story of their love and journey to find each other. Two who were once one become whole, the beginning of a beautiful family. All who know them rejoiced at their joining and that they had truly achieved their happily ever after. 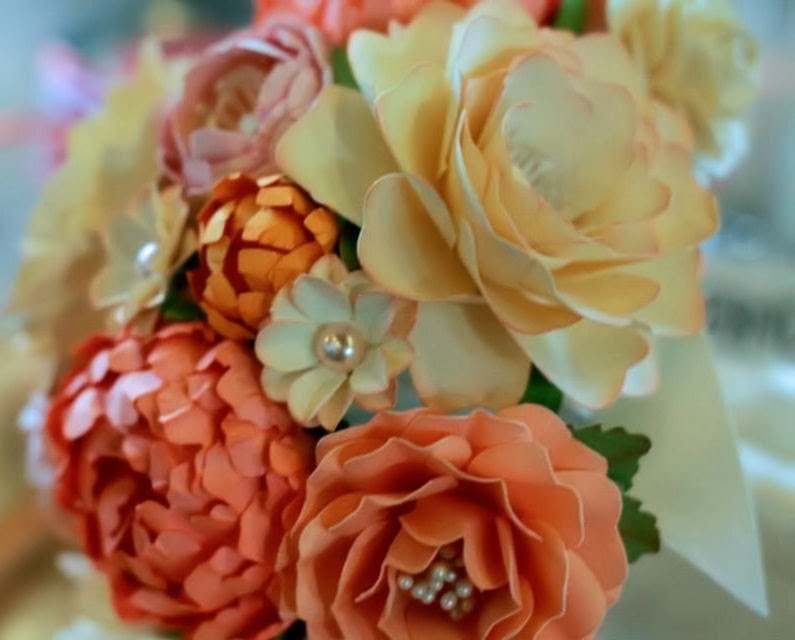 We are always honored when selected by a bride to take on her floral needs. It is an amazing feeling to know that our flowers we love so much, help tell the story of a couple's love and joining on one of the most important days of their life. We want to thank Jordan for allowing us to tell her sweet story, and for letting us showcase the beautiful flowers we created for her. She has truly been a customer we enjoy working with, and we more importantly have begun calling a friend. We'd also like to thank Jordan's photographer, Shannon Isereau of Rae of Life Photography for these incredible photos, and give them full credit for the photos shown in the blog. Jordan is a HUGE fan of Shannon's work, saying that without her amazing talent none of these beautiful photos would have been possible. She goes on to say that Shannon captured so many great moments throughout the day, and that thanks to Rae of Life she is able to vividly remember the day because of these fabulous photos! Visit our website www.morepaperthanshoes.com for more photos of our work! 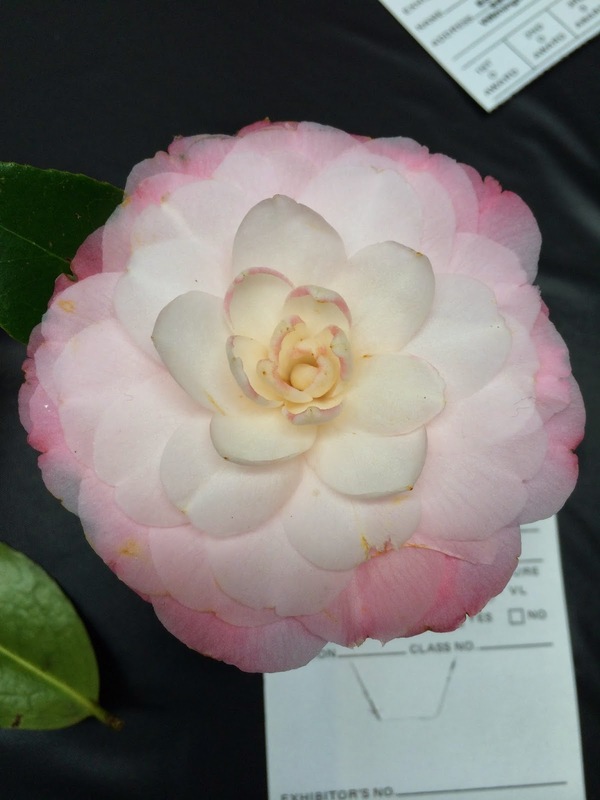 Over the weekend of the 22nd, we spent part of the day as a team walking the Norfolk Botanical Gardens! What a lovely day to see such a beautiful place! 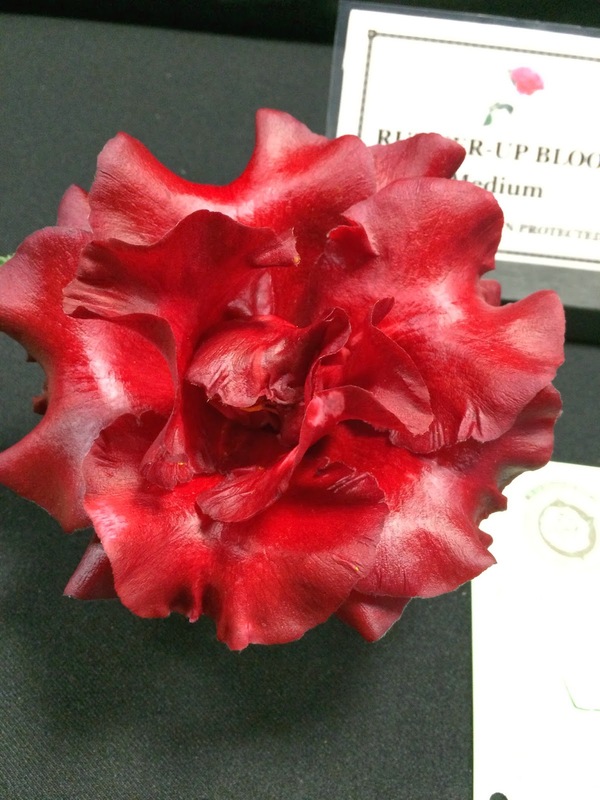 Although it wasn't peak bloom time there, we were able to see many beautiful flowers in the Winter Orchid display, and in the Bloom Competition that was going on there. Real flowers are what inspires each and every one of us here at More Paper Than Shoes, especially our Designer and Creator Anna. Taking the time to walk through the grounds and witness the beauty of nature was both refreshing and exciting. When you make flowers for a living, nothing is more inspiring or motivating then being around hundreds of hundreds of blooms. 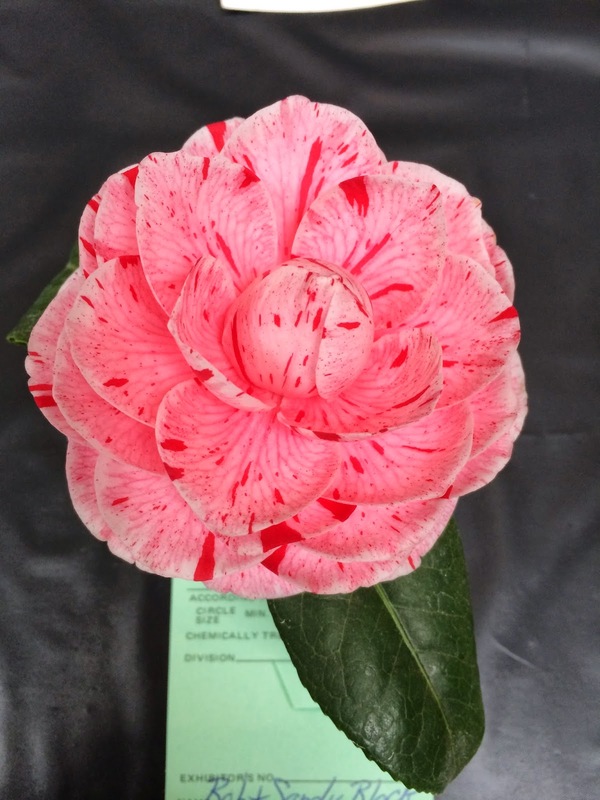 Some were so beautiful we couldn't help but think, "How would this look as a paper blossom?" 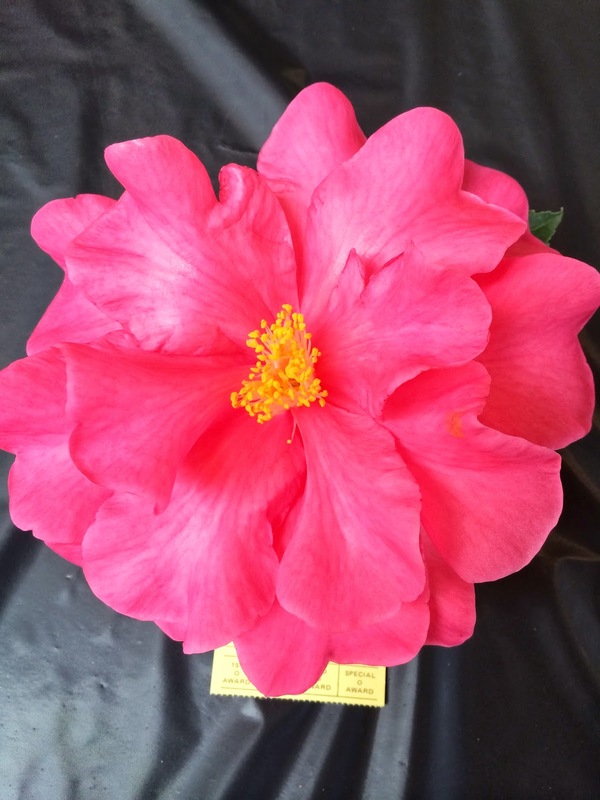 So to share with you several of the flowers that really captured our attention, we wanted to blog about this trip and the gorgeous inspiration that can be found in nature. 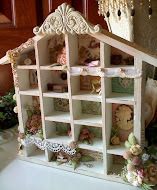 Our brides are always looking for something different and new. We want to be the first to give them something they've never seen before, and as a team, we feel the key to that lies in nature. In the softness of a bloom crafted in the pod of a seed we see the designs we need take our flowers a step or two further then the norm. 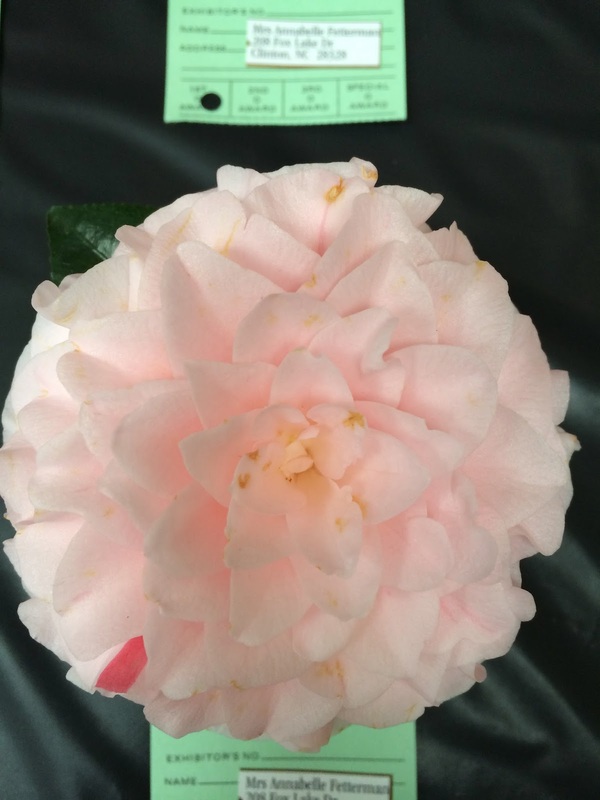 It seemed to be that the list flower, right above, had personality. 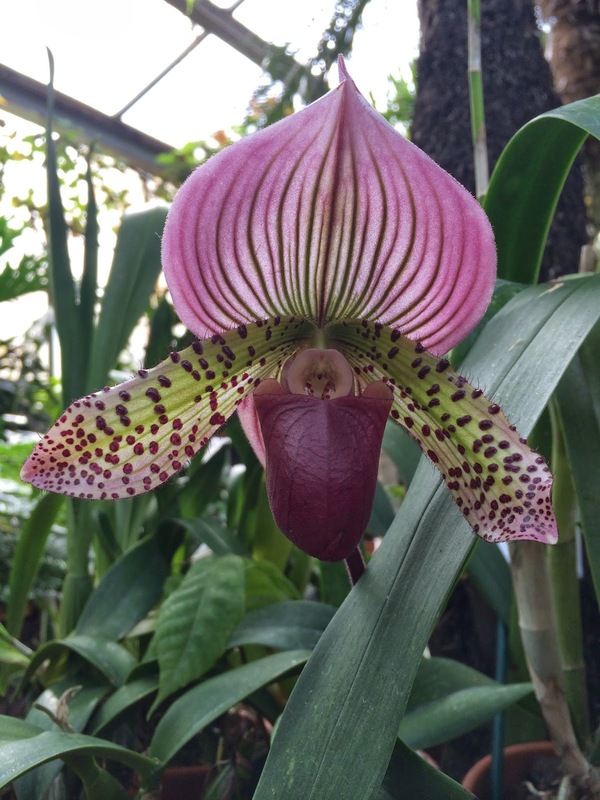 It was like being in Alice and Wonderland and waiting for this delicate orchid to start giggling and talking in a sweet soft prissy soprano. 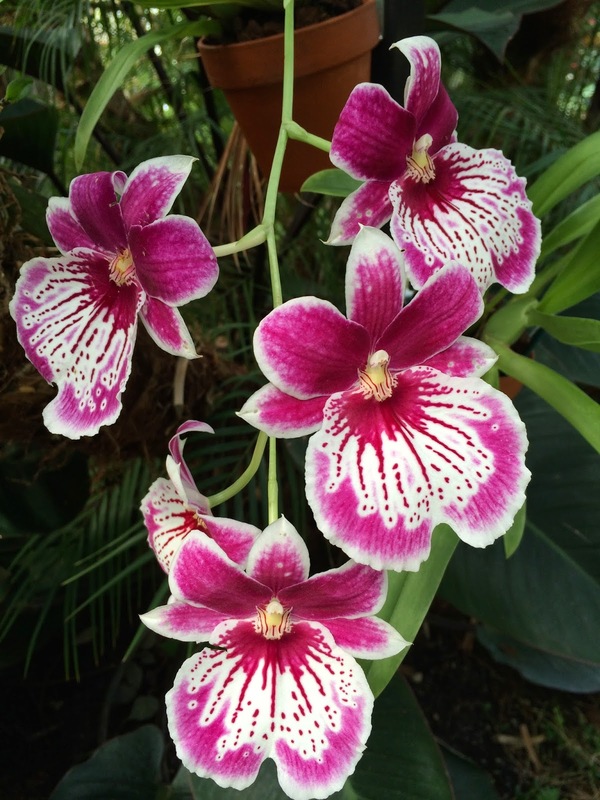 That's one of my favorite things about orchids, that they always seem to be smirking at you. 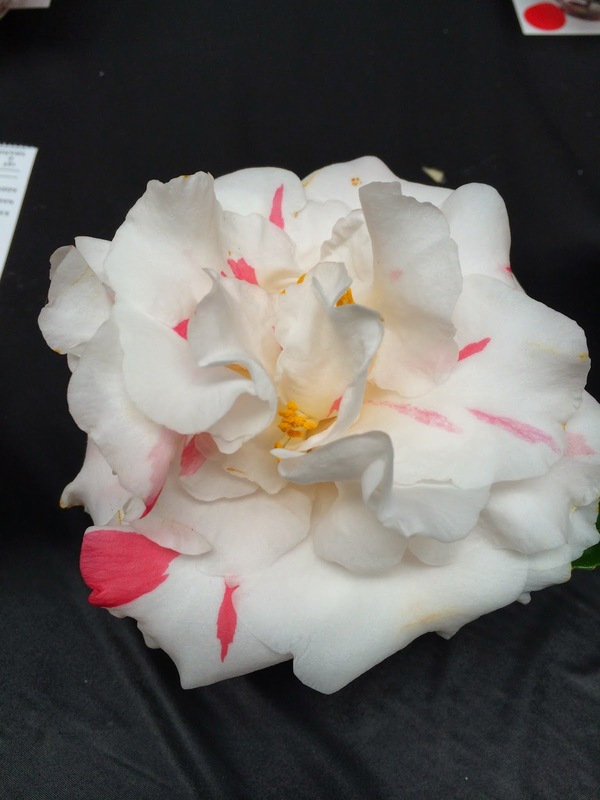 The delicate white of this flower with it's ruffled edges and soft touch of yellow was breathtaking, and inspiring. Looking through the greenhouse, we felt a strong sense of excitement and urge to take this inspiration given to us in nature and DO something with it! 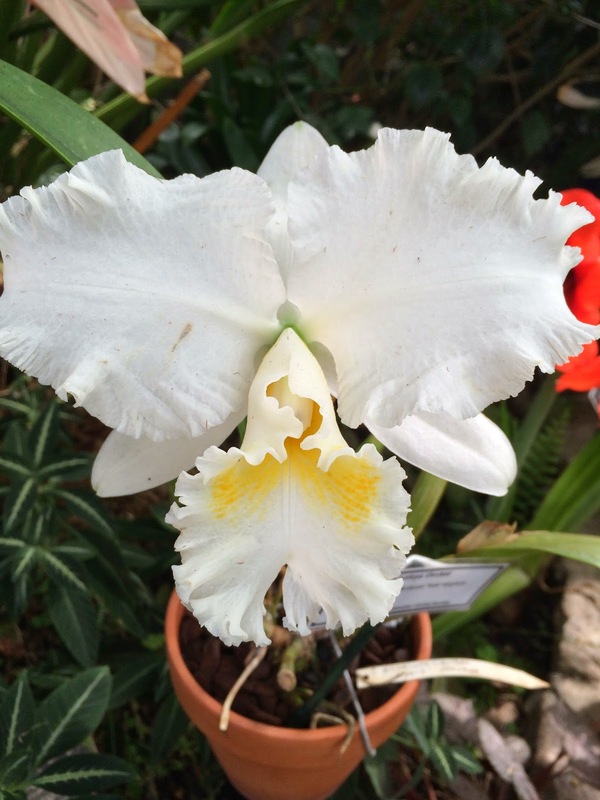 Anna was deep in thought as she walked the rows of potted orchids and tropical plants. You could almost see the flower sketches dancing in her head, playfully turning from side to side. Reaching out and touching these waxy blooms, you feel the delicate molding and shaping of the petals, where they joined, how they separated. It was AMAZING to study them as Anna does. After sadly leaving the Winter Orchid House (I never wanted to leave, it was too beautiful in there.) 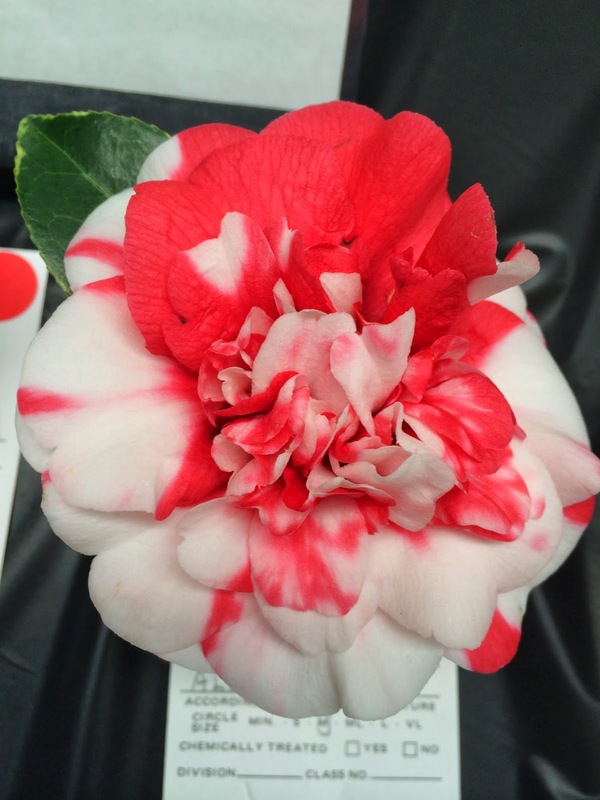 we went out to see the Contest Blooms! WOW! They were magnificent!! I don't know about you guys, but I would NOT have wanted to be one of those judges. These were blooms taken from outdoor plants, both protected and unprotected, all local to the Norfolk area. 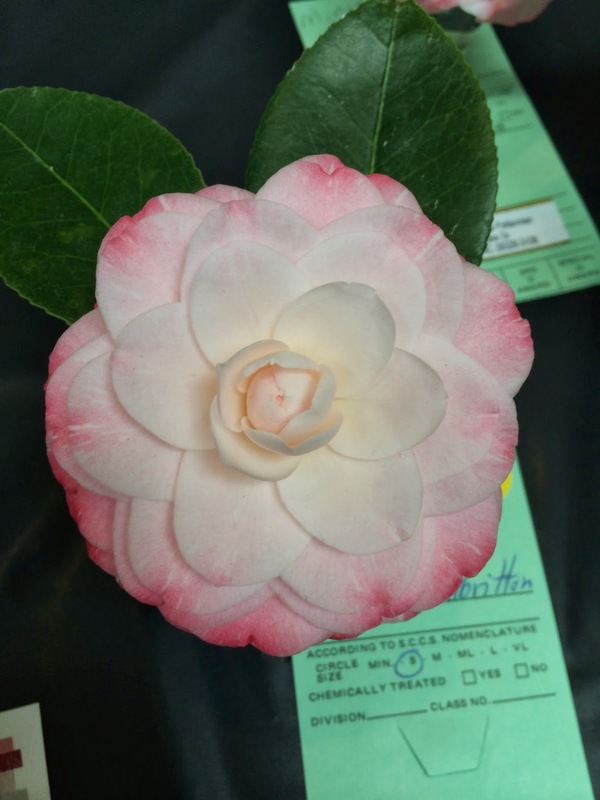 It was astounding how many blooms were entered, and I honestly couldn't find a flaw with any of them! I did have two favorites however! 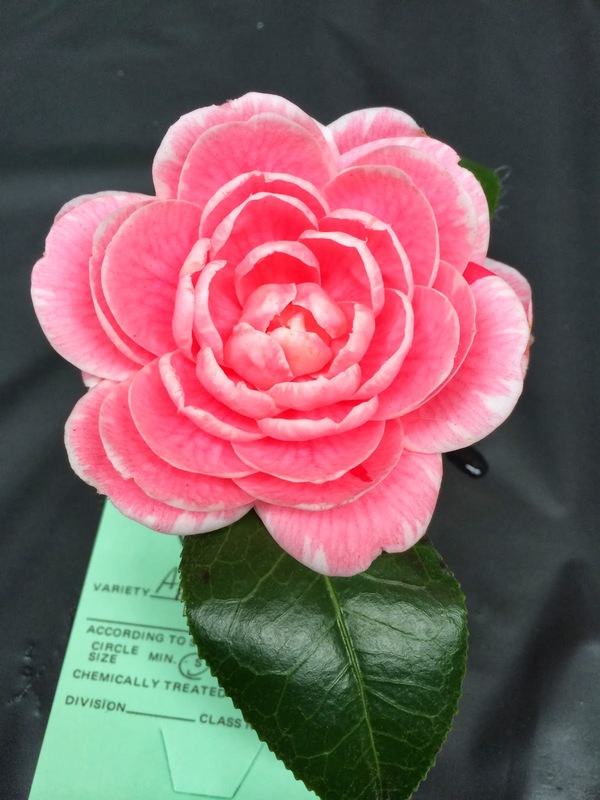 It was hard not to want to take up gardening after seeing these blooms! Then I remembered, I seriously lack the green thumb required. The mood of the contest was saturated with inspiration and excitement for us. 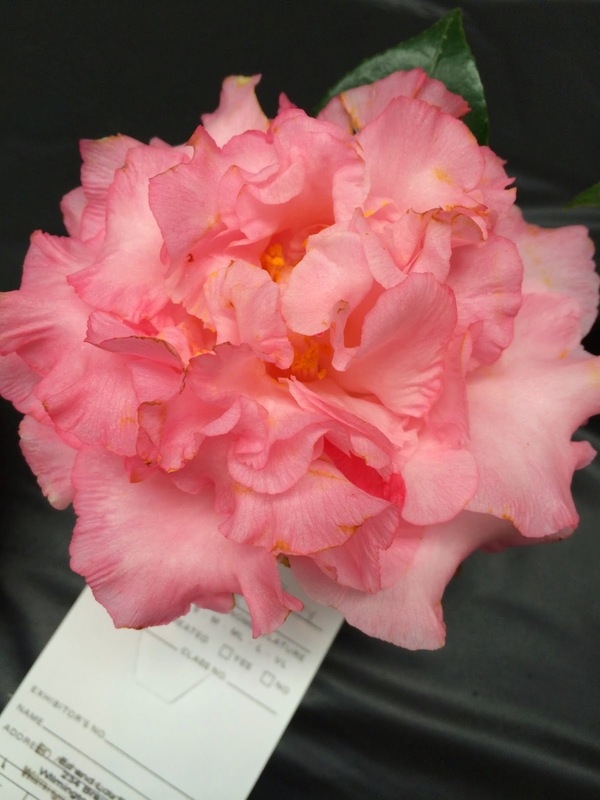 Looking at the color variations, the petal shapes, the overall shaping of the flowers, the precise blend of one of tone to another, we knew we'd be thinking flowers for the rest of the weekend (as if there were ever any doubt). 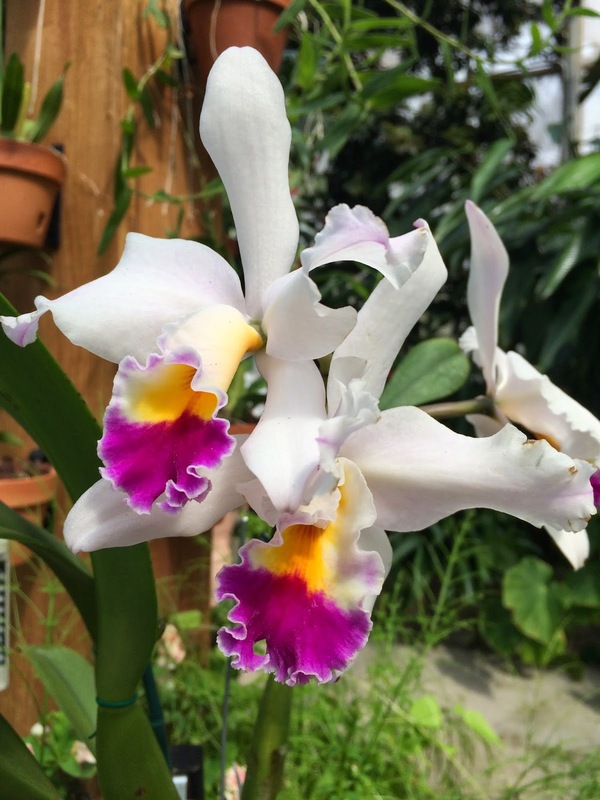 We hope you've enjoyed this walk through the Botanical Gardens with us. 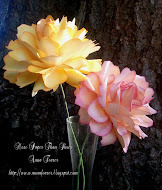 If you love paper flowers, make your own or are just beginning to, take a cue from what's around you. Go out, explore, find a garden where you can wander and day dream. Take inspiration from what's in nature to set yourself apart. 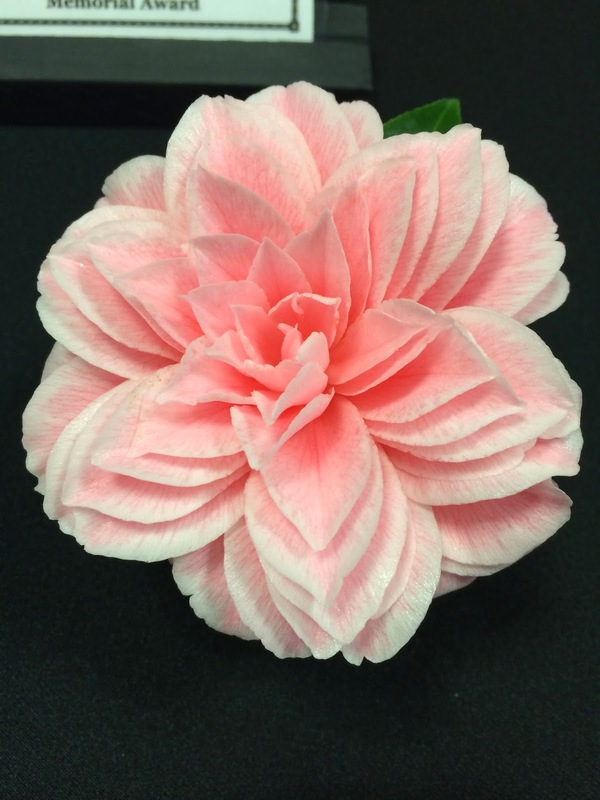 If you love MPTS' creations, keep watching the blog and fan page for the new customized flower designs that you'll be seeing over the coming months! With all the inspiration Anna gathered at the Gardens, you're sure to start seeing a whole new family of flowers at MPTS! Best wishes girls! Get out there and discover! Here at More Paper Than Shoes we have been brainstorming about some new blogging projects that would best showcase both our flowers AND our past bridal customers! We have had the extreme pleasure to work with some LOVELY, LOVELY brides! Wedding floral is one of the most important parts of a girl's big day and we are always delighted when a bride chooses us to handle this for her! We decided we wanted to revisit a different past bridal client each month, share her story, her flowers and feature her on our blog and fan page!! 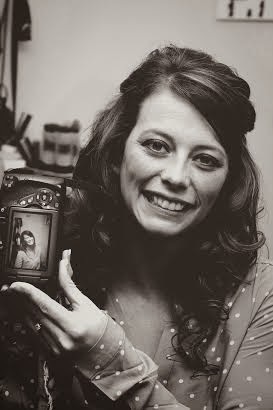 Our very first featured bride of the month begins here in March and she is absolutely BEAUTIFUL! 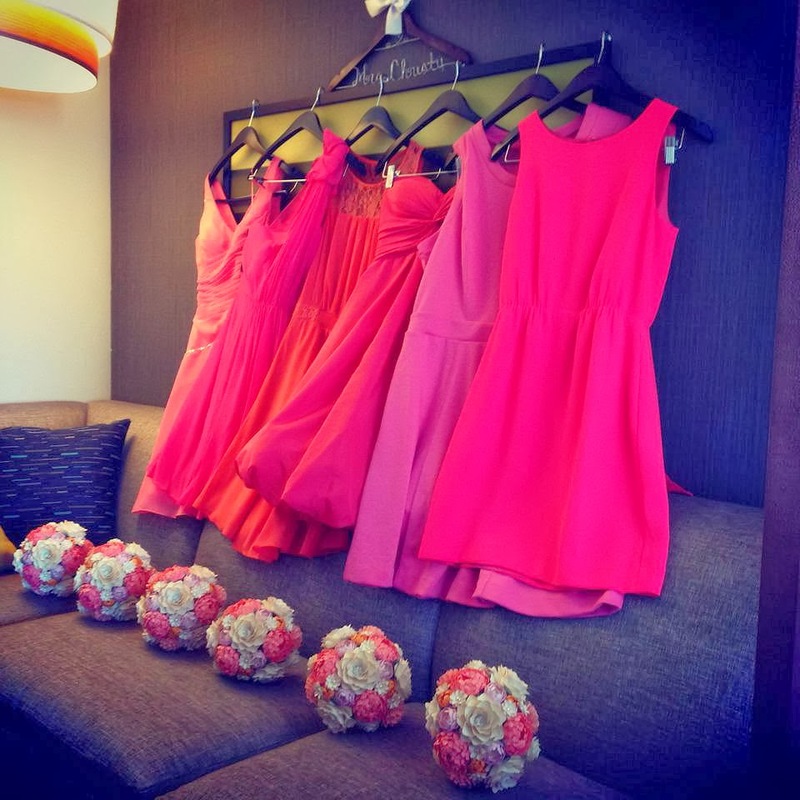 Laura's flowers, venue, dress, and story were SO charming, we just had to share her with all of our fans! 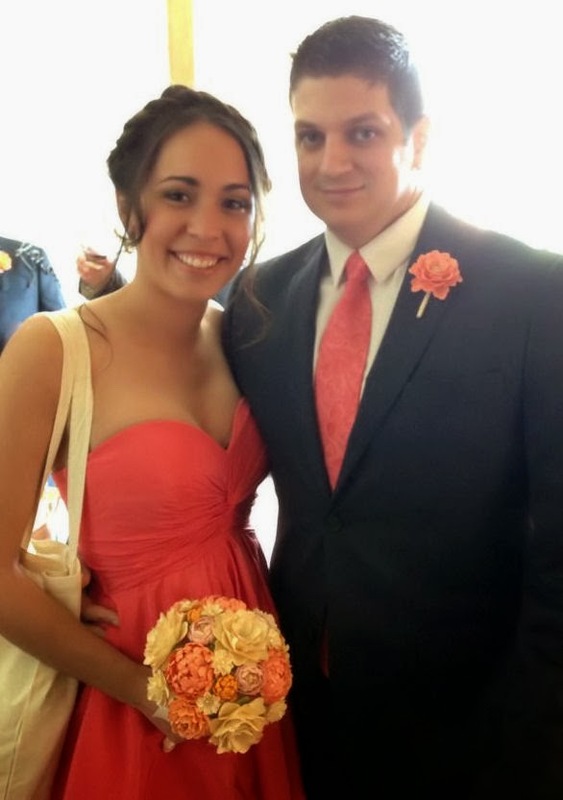 Laura met her groom Ryan, almost five years ago at a July 4th party. Ryan was a friend of her brother's and a few other mutual friends. When they met at the party, they immediately hit it off! They decided to go out to dinner together a couple of nights later and Laura tells us that the rest is history! Their engagement was equally as charming, and very fitting of their personalities! Laura is NOT a surprise person, and she shared with Ryan that she did not want to be proposed to in public, with a food item, and most importantly she wanted it to be a private, intimate moment. Her groom paid close attention to Laura's wishes, and he proposed to her in the quiet, cozy setting of their apartment living room, on their couch! She describes it as being perfect for them, and wouldn't trade it for all the billboard/airplane announcements in the world! This had us charmed! Her description of the loving, intimate moment of proposal between her groom and herself was just too darling! 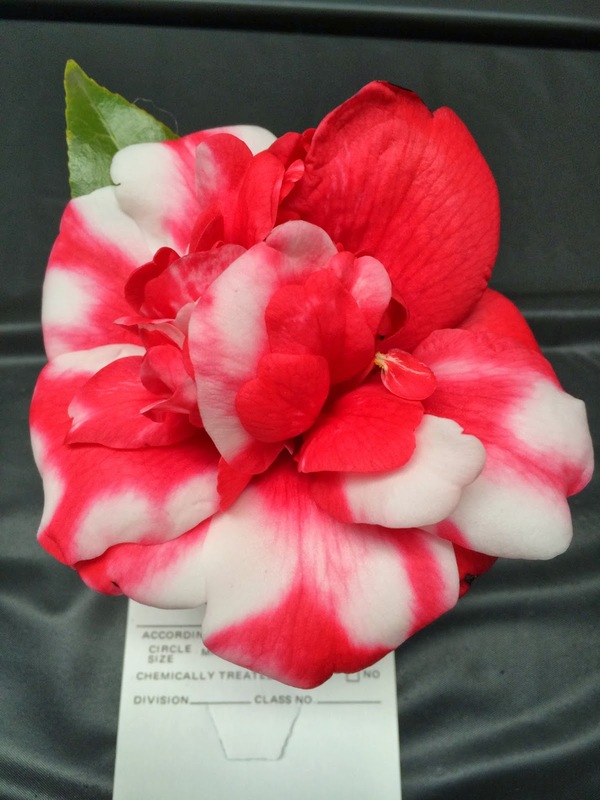 Laura's flower selections with us were truly one of a kind and we were thrilled when they were completed and shipped out to her. We couldn't wait for them to arrive! 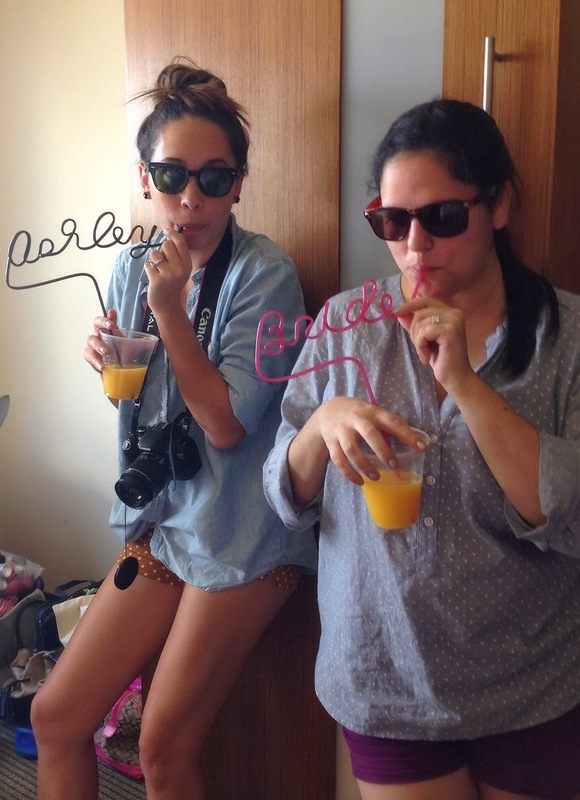 Laura is pictured below with one of her bridesmaids, Ashley, enjoying some OJ on the morning of her big day! 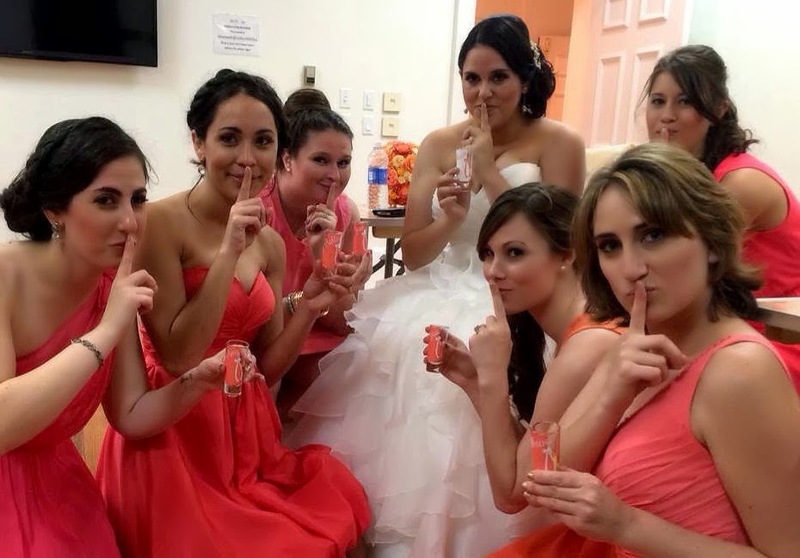 The girls and Laura had a little bit of fun before the ceremony started, to help keep them calm and collected! Can't you just tell that this a fun group of girls? 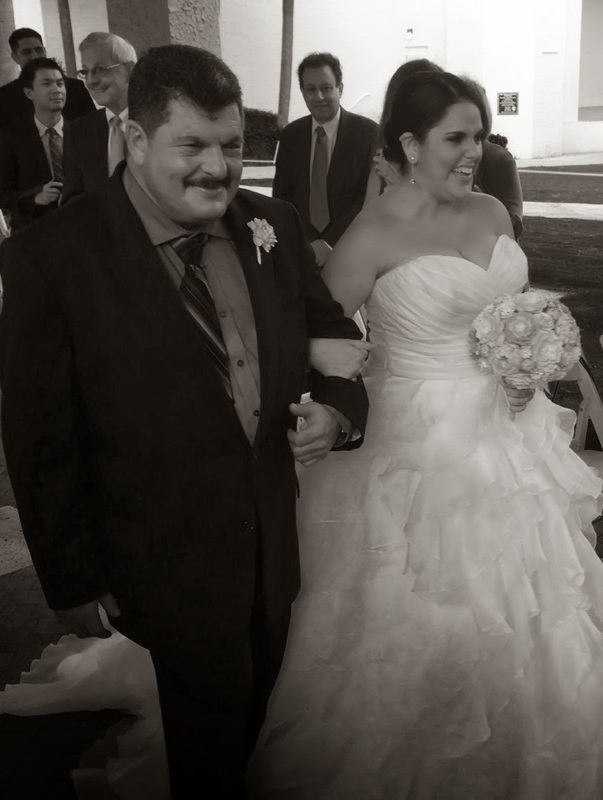 Laura and Ryan were wed in Delray Beach, Florida at venue called Old School Square. The setting was exactly the non traditional, unique feel Laura had searched for when planning her wedding. The venue was actually once a school, now converted into a Historic Arts Center. 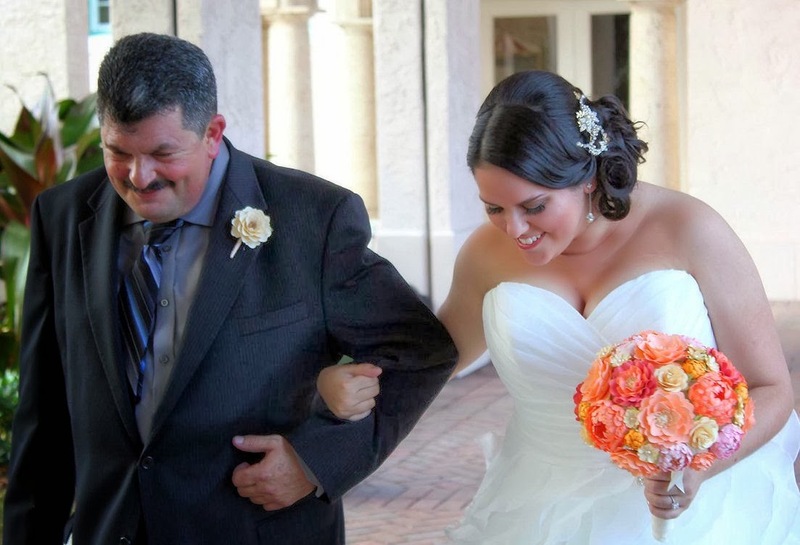 Below Laura is pictured being walked down the aisle by her father! Cocktail hour and the reception were both in the vintage gymnasium on site. 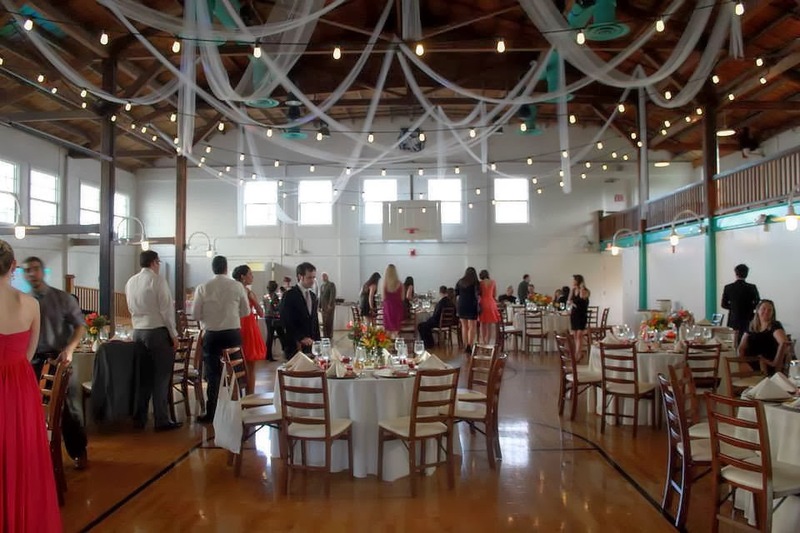 Pictured below is a photograph of the gymnasium and Laura's reception decor. It's obvious just how charming this beautiful venue truly was! 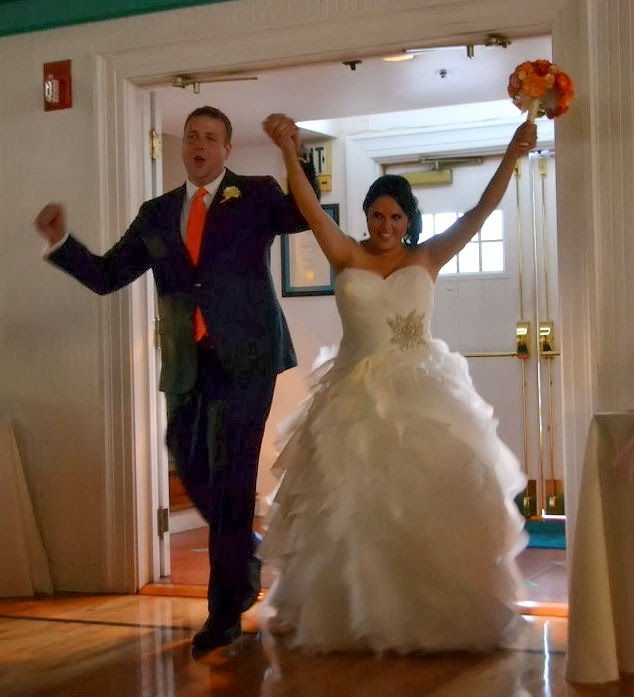 When the bride and groom entered the gym officially as husband and wife, they were a hit! 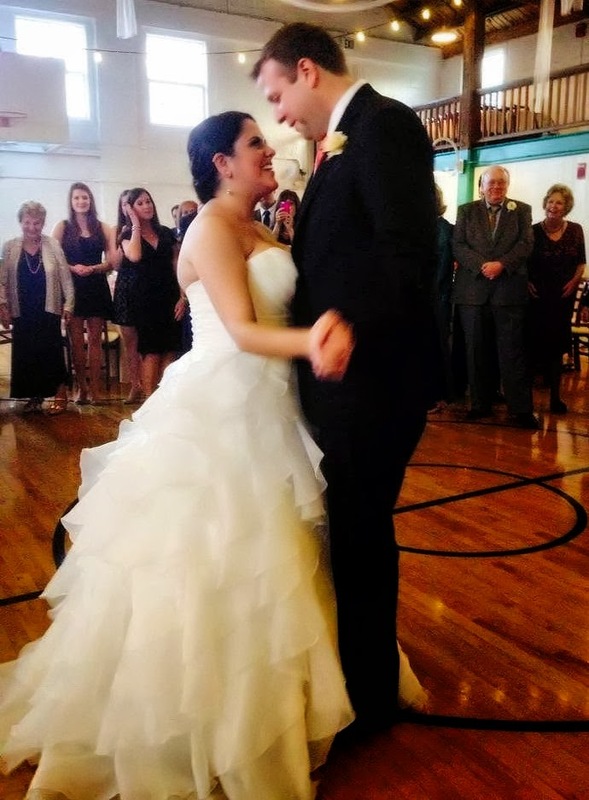 They shared their first dance and the reception began! 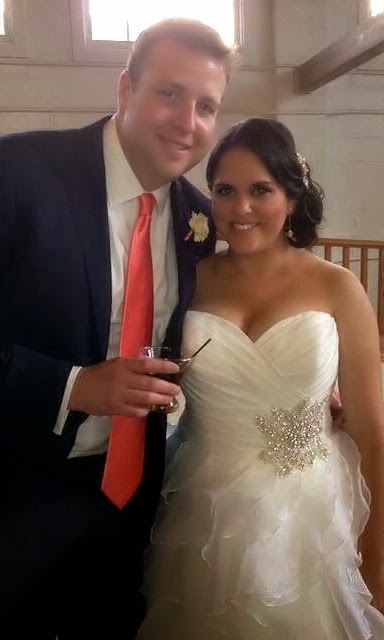 Laura's bridal package with us also included boutineers (as pictured above on her handsome groom, Ryan) and also loose flowers for the reception accents! You can see her lovely wedding flowers we created everywhere at the reception, from the "find your seat" sign area to the bridesmaid's bouquets they carried with them! 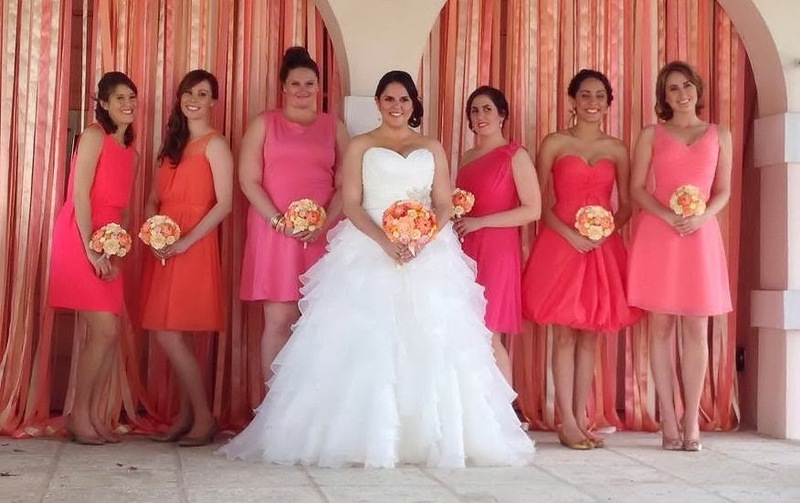 Laura's wedding was truly beautiful, with tones of coral and pinks that gave her wedding a pop of color unique and perfectly fitting her personality. 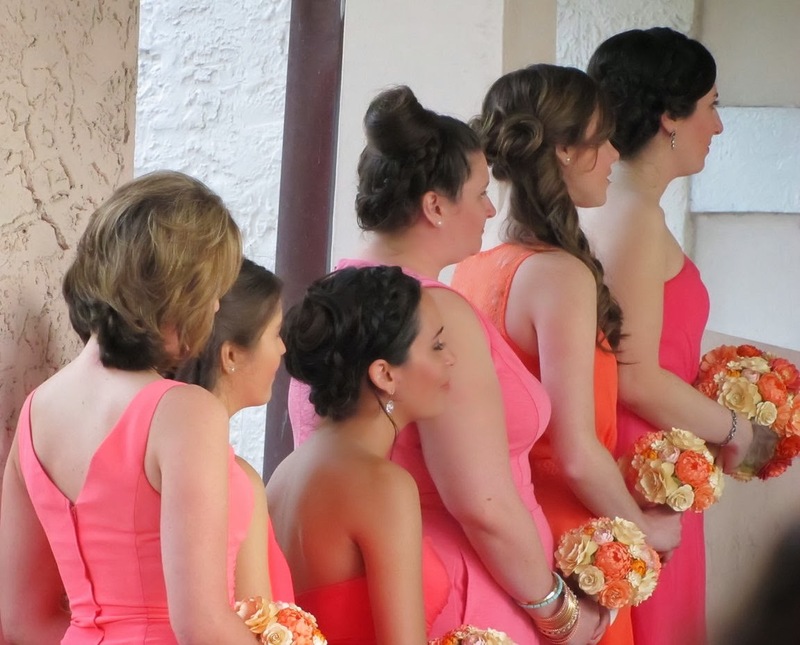 Our flowers were a lovely compliment to the already gorgeous bride, bridesmaids, and reception venue. We'd like to thank Laura Binder for allowing us to share her story, photographs from her lovely day, and most of all for choosing us as her wedding paper florist. We are so pleased to have had her as a past bridal client, and most importantly to have gotten to know this sweet, charmingly beautiful bride! Thank you again Laura and Ryan! Each time we create a custom bridal package for a bride, there is an immense amount of love, sweat and tears that go into it. We know that our flowers are a huge part of each bride's big day, and we want to make sure that every single petal is truly magical just for them. 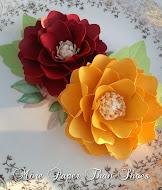 No two flower creations we make are exactly alike! Here at More Paper Than Shoes, we have a vision. We dream of a lovely garden, filled with our flowers, unending shades of beauty, petals that reflect the love and dreams of our brides, the happiness and joy they want to convey on their big day. We do what Mother Nature simply can't, which is to provide this beauty, this everlasting touch of charm to each and every one of our bridal client's big days regardless of weather, season, or location! 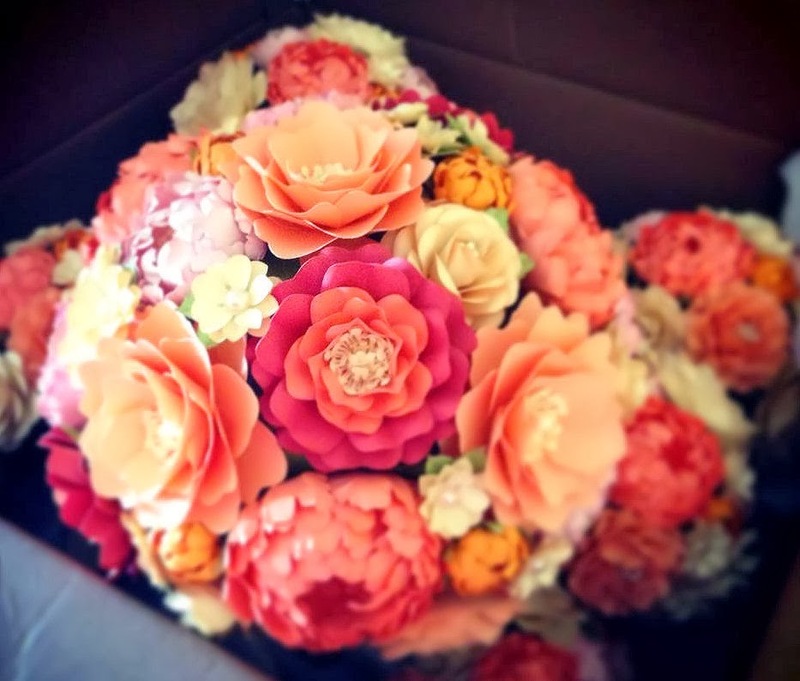 Or email us at mptsflowers@gmail.com for custom bridal package quotes and information!